Archie Comics is on a tear lately, successfully redefining itself as a publisher. That transformation includes reimagining Archie and his crew, making Sabrina, the Teenage Witch darker and getting very adult with Dark Circle Comics. Now, the publisher is teaming up with Madefire for a brand new digital comics app. The new app, which goes live on iOS devices today, will feature a bold, streamlined storefront showcasing all of Archie’s diverse and top-selling titles, graphic novels and exclusive digital content. While many comic publishers have chosen to keep their buy-as-you-go and “unlimited” digital comics apps separate, the new Archie Comics app forges new ground by merging both—allowing fans to experience the many worlds and adventures of their favorite Archie titles under the convenient roof of one aesthetically pleasing and groundbreaking app. App users will be given the option to utilize the “Archie Unlimited” service, an “all you can read” option available exclusively through the new Archie Comics app. 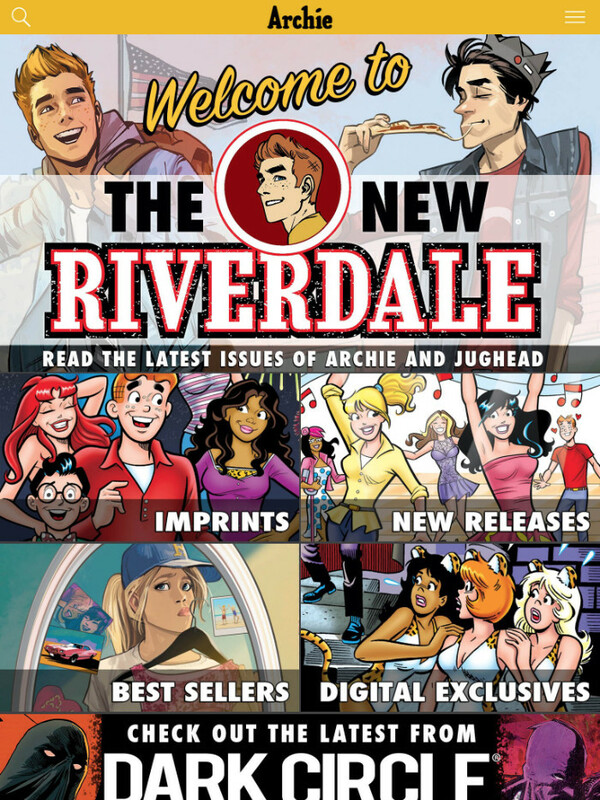 In terms of content, the app will include comics and graphic novels from every Archie imprint, including the New Riverdale titles, traditional Archie stories, Archie Action’s Sonic and Mega Man series, Archie Horror and the company’s Dark Circle super hero books, eliminating the need for fans to switch between apps to fully enjoy the diverse and beloved Archie Comics experience. Additionally, the Archie Comics app will also feature a number of must-have exclusives for Archie fans, including the all-new Pep Digital ongoing series of collections and a new line of Dollar Digests. The app, which boasts an all-new comics reader showcasing an improved and fluid reading experience, will also give readers new navigation options—allowing fans to browse by imprint, series, best-sellers and most popular, in addition to the ability to search directly for comics of their choice. New York, NY (November 12) – Archie Comics, the acclaimed and bestselling comic book publisher that is home to some of the most well-known pop culture creations in the world, including Archie, Jughead, Betty & Veronica, Josie & The Pussycats, the Dark Circle heroes, Sabrina the Teenage Witch and the hit AFTERLIFE WITH ARCHIE and CHILLING ADVENTURES OF SABRINA horror series, announced today that it will relaunch its digital comics app in partnership with innovative technology company Madefire. The new app, which goes live on iOS devices today, will feature a bold, streamlined storefront showcasing all of Archie’s diverse and top-selling titles, graphic novels and exclusive digital content, including the year’s biggest new comic books, ARCHIE by writer Mark Waid and artist Fiona Staples and JUGHEAD by writer Chip Zdarsky and artist Erica Henderson. 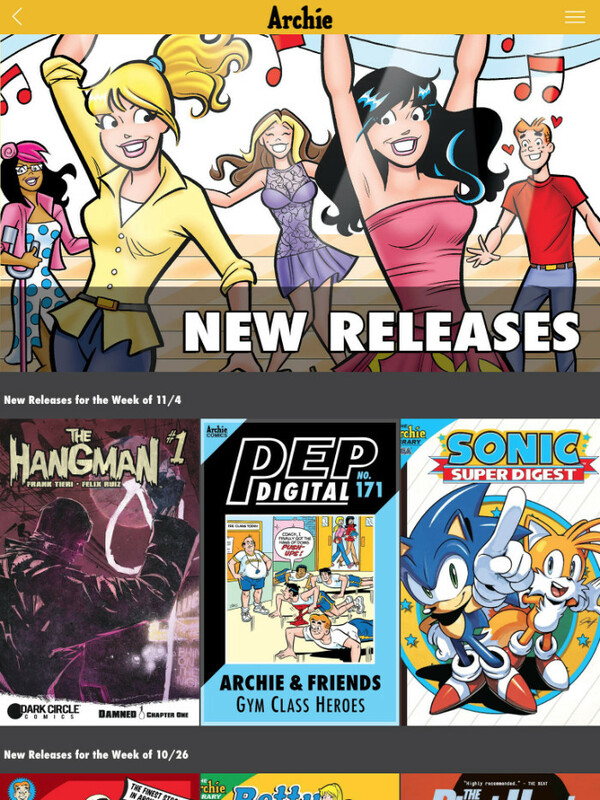 While many comic publishers have chosen to keep their buy-as-you-go and “unlimited” digital comics apps separate, the new Archie Comics app forges new ground by merging both—allowing fans to experience the many worlds and adventures of their favorite Archie titles under the convenient roof of one aesthetically pleasing and groundbreaking app. App users will be given the option to utilize the “Archie Unlimited” service, an “all you can read” option available exclusively through the new Archie Comics app. In terms of content, the app will include comics and graphic novels from every Archie imprint, including the New Riverdale titles, traditional Archie stories, Archie Action’s Sonic and Mega Man series, Archie Horror and the company’s Dark Circle super hero books, eliminating the need for fans to switch between apps to fully enjoy the diverse and beloved Archie Comics experience. Additionally, the Archie Comics app will also feature a number of must-have exclusives for Archie fans, including the all-new PEP DIGITAL ongoing series of collections and a new line of DOLLAR DIGESTS.